OMG ya’ll, I’ve got so much stuff lined up, but I’ve been super busy! But a big thank you to all the positive feedback, I’m glad ya’ll are enjoying it as much as I am creating it! Ok, to kick off this week let’s start with a product review! I love nail polish and I feel like I’m always picking up a new color here and there. I’m usually a slave to OPI, but lately I’ve really been loving Essie’s colors. They recently debuted a new collection called Mirror Metallics which is a set of five colors in metallic-y finishes. I picked up a shade called Penny Talk, which is their copper shade, but honestly it’s mellow enough to be more of a rose gold which is what I thought it was at first. 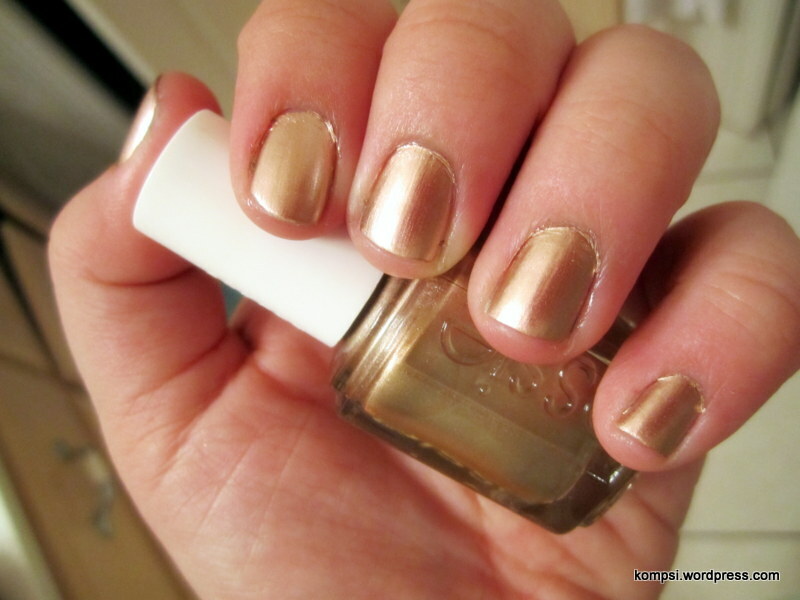 The formula is a little thicker and dries faster than a typical polish, which I guess is for the metallic effect. I used OPI’s basic base coat and made sure to take long, even strokes with the color, with not too much polish on the brush. It dries to a semi-matte finish, which I thought was really pretty so I didn’t add a top coat. I used one coat of base and two coats of Penny Talk. Staying power was average for me, it started chipping after about four or five days. This color is such a perfect neutral, it really goes with everything. Although I do have a number of very neutral, plain colors, I don’t typically use them because I love using either something really bright, really dark or really sparkly (or some combination of those!). But this was nice because it was just different enough to not be boring, but it wasn’t totally out there in terms of color. Penny Talk, as well as the rest of the Mirror Metallics line, should be available at most drug, grocery and/or beauty stores. I got my bottle at CVS, but I’ve seen it at Ulta, HEB and Walgreens. It runs about $8 for a full sized bottle. I’ve been craving new Essie polishes. This might be my next buy/ on my wish list for a carepackage. Thanks for the review! Hey! That’s the exact color I’m wearing! I lovelovelove it. Metallics are never a waste of money because they go with everything.